At the beginning of April 1941 Brigadier Caunter left the brigade to go to India: he was succeeded by Brigadier A. H. Gatehouse, DSO, M C. At the same time Rommel, counter attacked at Agheila, and was soon at the gates of Tobruk. 11th Hussars and the Support Group were rushed up to hold the frontier. The brigade had no tanks and was forced to stay in Cairo. In May an unsuccessful attempt to relieve Tobruk had resulted in the recapture of Halfaya and Capuzzo, both of which were lost again when Rommel counterattacked on May 30th. A major operation to relieve Tobruk, called Operation Battleaxe, was planned for the middle of June: for this operation the brigade took over command of 4th Royal Tanks and 7th Royal Tanks, the latter having one squadron of 1st Royal Tanks under command, both equipped with Matildas. We were to advance on the left flank Of 4th Indian Division along the top of the escarpment towards Halfaya, while the rest of 7th Armoured Division were to outflank Capuzzo from the south. The battle opened on June 15th and lasted till the 21st. It was a complete failure. The unreliable, painfully slow Matildas were never designed to operate as cruiser tanks. Many broke down on their way to their objectives: many more were knocked out by 88s before they knew what had hit them. On our left 7th Armoured Brigade were having an equally bad time against German Mark IIIs and 88s, 6th Royal Tanks in particular suffering heavy losses at Hafid Ridge. The attack was a complete failure and was only saved from turning to disaster by the brilliant work Of 4 RHA under the command of Jock Campbell, their 25 pounders being the only guns we had which could compete with the German tanks. In this battle the brigade lost almost all its tanks and 4th and 7th Royal Tanks were withdrawn to Alexandria, where they were joined by their original brigade HQ, 1st Army Tank Brigade, arrived from England. 4th Armoured Brigade HQ returned to Cairo to form a new brigade. As armoured regiments we now had 8th Hussars from 7th Armoured Brigade, 3rd Royal Tanks returned from Greece where they had served with 1st Armoured Brigade, and 5th Royal Tanks, survivors of the ill fated 3rd Armoured Brigade, lost in Cyrenaica in April. In addition we were joined by 2nd Regiment Royal Horse Artillery, also from 1st Armoured Brigade, and as our motor battalion we welcomed 2nd Battalion Scots Guards. We were thus the first armoured brigade group ever to be formed. In September we returned to the desert and continued training near Bir Kenayis, south-west of Matruh, moving up to join the rest of the division at the end of October between Piccadilly and Maddalena. During the summer many changes had taken place. General 'Strafer' Gott had succeeded General Creagh in command of 7th Armoured Division and Jock Campbell had taken his place in command of the Support Group, John Currie succeeding him in command of 4 RHA. Eighth Army had been formed, General Cunningham being appointed to command. In October we were joined by 22nd Armoured Brigade, consisting of the 3rd and 4th County of London Yeomanry (Sharpshooters) and the and Royal Gloucestershire Hussars. 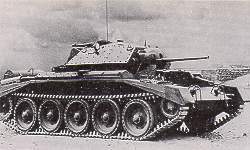 They had come ahead of the rest of 1st Armoured Division and were equipped entirely with the new Crusader tanks (A 15). Before dawn on November 18th we crossed the frontier once again, the beginning of Operation "Crusader". After passing through the wire, we turned north and at Bit Sciafsciuf had our first brush with the enemy. This proved indecisive, the enemy withdrawing during the night. Advancing north the following morning we met the whole of 15th Panzer Division at Gabr Taieb el Essem, north-west of Scheferzen. A fierce battle ensued, in which we did our best to overcome the disadvantages of armour and armament, but suffered heavily as a result, 8th Hussars having particularly heavy casualties. The battle continued in the same area on the 20th, the enemy being reinforced by 21 Panzer Division at the end of the day. Meanwhile 22nd Armoured Brigade had been ordered to mote east from Bir Gobi to join us. During the night 20/21st the enemy moved west: we made contact with him at Gabr Saleh early in the morning of the a 1st, being joined later there by 22nd Armoured Brigade. Another fierce battle followed until the enemy began to withdraw north-west towards Sidi Rezegh, where 7th Armoured Brigade and Support Group were holding the aerodrome. We pursued as far as we could but, owing to our short range, had to stop and refuel. We caught up again on the 22nd and helped to relieve pressure on 7th Armoured Brigade and Support Group, who had been facing alone the combined onslaught of 15th and a 1st Panzer and 90th Light Divisions. On the 23rd the initiative definitely passed to the enemy. 5th South African Brigade, protected by the remnants of 22nd Armoured Brigade, were completely overrun at the cost to the Germans of 45 tanks. Support Group had suffered heavy casualties and 7th Armoured Brigade with it was reduced to less than a squadron of tanks. Support Group and 7th Armoured Brigade therefore were withdrawn on the night of 23/24th. 4th Armoured Brigade remaining in the area east of Sidi Rezegh to protect the left flank of a NZ Division, who had come west from Sidi Azeiz, by-passing Capuzzo. On the 24th Rommel advanced east from Bir Gobi, along the Trigh el Abd, and south-east from Sidi Rezegh. His advance passed north of 1st South African Brigade, south of most of 7th Armoured Division, through the north edge of 30 Corps FMC and drove 30 Corps Headquarters before it all the way to Scheferzen. It caused considerable confusion but surprisingly little damage. During the night Support Group and Div HQ drove through the enemy from north to south and settled down to protect the FMC. The combined strength of 4 and 22 Armoured Brigades on this day, November 25th, was about 50 mixed Crusaders and Stuarts. 7th Armoured Brigade had ceased to exist. 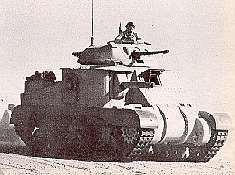 All the tanks were therefore concentrated in 4th Armoured Brigade which moved to Bir Taieb el Essem, on the Trigh el Abd between Bir Gobi and Gabr Saleh, to protect 1st South African Brigade who were being menaced by a party of tanks which Rommel had left behind. 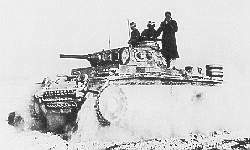 On the 26th the terrific efforts of workshops and recovery produced more tanks, and the brigades split again, 4th having 77 Stuarts and 22nd 42 Crusaders. On the 27th Rommel, having achieved nothing by his wild drive across the desert to join hands with his frontier outposts, still holding out, began to move north to Sidi Azeiz and thence west along the Trigh Capuzzo, heading for Sidi Rezegh again. The brigade, with 22nd Armoured Brigade, was ordered north to intercept him and made contact near Gasr el Arid at two o'clock in the afternoon, Support Group meanwhile harrying the tail of the column to the east. Throughout 28th and 29th we continued a running battle on the Trigh Capuzzo near Bir Chleta, trying to prevent Rommel joining hands with Rawenstein and thus cutting off the New Zealand Division, which had linked up with the garrison of Tobruk at Belhamed. It became more and more difficult, pressure on the New Zealanders from the west increasing daily. On the 30th 1st South African Brigade moved north east from Bir Taieb el Esserm to the escarpment east of Sidi Rezegh, while we protected their right flank. During that night they tried to drive west along the escarpment to join hands with the New Zealanders at Sidi Rezegh, but they could not get beyond a hill called Pt 175 to the east of the aerodrome. At first light on December 1st they were astride the escarpment, Support Group on their right flank, east of the New Zealand Division, ourselves on their left flank at Abiar el Nbeidat. General Freyberg was now being attacked from north and south, had little ammunition left and had been given permission to withdraw by General Norrie, who had made contact with him and under whose command he had now been placed, communications with 13 Corps in Tobruk having been cut again. In order to cover the withdrawal of the New Zealand Div and to try and save the many already surrounded, 4th Armoured Brigade were ordered to drive straight down to Belhamed, across Sidi Rezegh aerodrome, between the enemy on the escarpments on either side. At eight o'clock we advanced into a situation resembling in almost every detail the charge of the light brigade at Balaclava. We reached Belhamed, rallied and protected a brigade of the New Zealand Division which had been partially overrun and held off all counter attacks, until the New Zealanders had withdrawn to the east and re-organised. We then returned to our station on the south flank of 1st South African Brigade. Tobruk was now entirely cut off again. The brigade, with the rest of the division, was withdrawn to the Trigh el Abd in preparation for a thrust in co-operation with 4th Indian Division towards El Adem. After one more attempt to get supplies to his immobile troops sitting in the defences at Halfaya and Bardia, the enemy concentrated his forces between Bir Gobi and El Adem. From December 4th to 6th 11 Indian Brigade attacked the enemy position at Bir Gobi. Every attempt to outflank it made by the brigade was invariably met by a screen of anti-tank guns, backed up by tanks. Operating on the inside of the circle, the enemy could and did forestall us every time. On December 7th the enemy began to withdraw north-west and contact was again made with 70th Division in Tobruk. We had a successful last light battle between El Adem and Bir Acroma on that day: by the following morning the enemy had withdrawn completely clear of Tobruk perimeter. 22nd Armoured Brigade was now withdrawn, leaving us, the only armoured brigade still in the division, with a composite regiment made up from their three regiments. The brigade was now launched on a wide outflanking movement, designed to cut off the enemy in the area of Bir Temrad. After a savage counter-attack against 5th India Brigade, the enemy withdrew rapidly as the threat developed. We pursued to Mechili and then lost touch. Following our old tracks, we continued the pursuit to Msus and Agedabia, where we were relieved by 1st Armoured Division. Rommel had started the battle with nearly 300 tanks, excluding Italian. We had started with a superiority of 3 to 2 in numbers, but, except in the case of the Italians, we were in every case inferior in armament and armour. 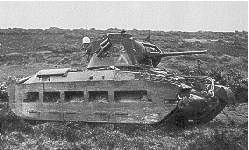 The crusaders and Matildas of 22nd and 1st Army Tank Brigades respectively were also extremely unreliable. The enemy's most outstanding superiority was in anti-tank guns. The South African Division had a few 18 pounders: apart from them the two-pounder was the best we had and they were not in liberal supply. 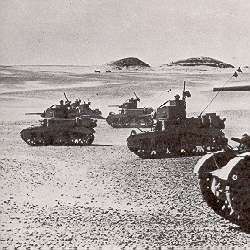 In spite of these disadvantages we had driven the enemy from the frontier of Egypt and the perimeter of Tobruk out of Cyrenaica altogether, reducing him, until reinforcements reached Benghazi by sea, to a strength of 8 tanks at one time. Let nobody ever belittle the remarkable achievements of the Crusader operation. That the fruits of our success were so soon to be lost again in our absence was as bitter a disappointment as it had been the year before. We returned again exhausted and somewhat disorganised to Cairo. We reformed again with the same armoured regiments, 1st RHA, released from Tobruk, replacing 2 RHA, and 1st Battalion KRRC from the Support Group replacing 2nd Battalion Scots Guards. We were equipped again with Stuarts and, as they became available, with Grants. In them at last we felt we had a tank, which if not the superior, was at least able to take on a German tank on more or less equal terms. In April we returned to the desert and continued training south of Sidi Azeiz. Brigadier Gatehouse, who had commanded the brigade with skill and vigour through many difficult and anxious battles, now left us to take over command of 10th Armoured Division. In his place Brigadier G. W. Richards, DSO, MC came to us, having been GSO 1 of 7th Armoured Division throughout the Crusader operation and then second-in-command of 22nd Armoured Brigade. At the beginning of May we moved up to the area east of Bir Hacheim, relieving 1st Armoured Division. By now each armoured regiment had 24 Grants and 20 Stuarts, and 1 RHA's anti-tank battery was being equipped with the new 6-pounder guns. We continued training, concentrating particularly on gunnery and artillery support. Plans were afoot for an offensive, an operation to be called Buckshot designed to recapture Benghazi; but it soon became clear that Rommel was intending to attack shortly too, and it was decided to let him run his head into the trap. On May 26th a large column moved east from Segnali, apparently heading straight down the Trigh Capuzzo. Before last light part of the column was seen to turn south-east. During the night the whole force, joined by others moving direct from Segnali, turned south and by first light had refuelled south of Bir Hacheim. At 5 o'clock in the morning the brigade received the order to move to its southern battle position. At eight o'clock we found ourselves faced by the whole of 15 and 21 Panzer Divisions, with one regiment still not in position. A fierce battle ensued in which we lost almost all our tanks. 90th Light Division had meanwhile swept past us to the east and reached the outskirts of El Adem. Divisional HQ had been overrun and had ceased to exist. 22nd Armoured Brigade, caught facing the wrong way by a battle group which had overrun 3rd Indian Motor Brigade and passed between us and Hacheim had suffered heavily. The French were firm in Hacheim, having repulsed Ariete Division; the Guards were firm as a rock in Knightsbridge. 2nd Armoured Brigade were more or less intact south-west of El Adem. By the end of the day the remnants of the brigade had rallied and were holding the escarpment east of the E1 Adem box, after as disastrous a day as the brigade has ever known. The enemy was as disorganised as we: he tried to reach Acroma, failed, and then collected himself in the Cauldron, breaking out of it westwards to re-establish his L of C, overrunning 151 Brigade and 1st Army Tank Brigade in so doing. In an attempt to destroy him in the cauldron and relieve pressure on 151 Brigade, an attack was put in from the east in which 4th Armoured Brigade did not take part. It was a failure and cost 1st Armoured Division and 10th Indian Division heavy casualties. By now all armoured brigades were much depleted and disorganised. 1st Armoured Brigade, brought up to Capuzzo, was split up and distributed among the other brigades. Regiments were amalgamated and reformed every day. Brigades changed regiments and divisions changed brigades, sometimes more than once a day. By June 11th, the day after the withdrawal from Hacheim, the remains of four armoured brigades, 1st, 2nd, 4th and 22nd, were all under command of 4th Armoured Brigade in the area between El Adem and Knightsbridge. During the 12th the enemy moved in groups eastwards from the minefield near Bir Harmat to the Wadi running south-west from E1 Adem, near Hagfet Sciaaban. By the end of the day he had concentrated all his armoured strength in this area behind us and directly threatening E1 Adem, Belhamed and the gateway to Tobruk. During the night he dug in his anti-tank guns on the lip of the wadi. On the morning of June 13th we were ordered to advance south from our battle position, around the withered fig tree of Naduret el Ghesceuasc, to engage the enemy concentration. Using hardly any of his tanks, but almost entirely with his anti-tank guns, the enemy reduced the brigade to a handful of tanks. Up till then his losses in tanks had generally been in the same proportion to his total strength as our own. By the end of the 13th we had lost almost all we had left and he none at all. The die was cast: the initiative was now his, with Tobruk and Belhamed crammed with unnecessary stores and L of C troops, put there for the projected offensive, with 50 Div and the South Africans still strung out well to the west of Tobruk. It was a grim prospect. That night the gallant Guards Brigade, who had clung so grimly to Knightsbridge, were withdrawn, 2nd Armoured Brigade taking command of all tanks west of E1 Adem, while we took over all the tanks east of it, which included the daily flow of motley tanks and crews formed from stragglers and recovered and repaired tanks. While Tobruk was defended and lost and the whole army withdrew eastwards, the brigade daily fought delaying actions against Rommel's 15th and 21st Panzer Divisions, who strove in vain to cut off the columns retreating along the coast. Daily our strength fell: sleep was as precious as it was rare. When we reached the Matruh-Siwa road, we were relieved by 1st Armoured Division and handed over to them the mixed collection of regiments and tanks we still had left.